Our server Westin took such good care of us! Made our trip! Beautiful property with great art and a great vibe. Right across from FST Improv, which was hilarious! The rooftop bar has a killer view of Sarasota and Longboat Key. I stayed here for business and loved it! All of the staff were friendly and helpful, especially the front desk. The lobby and bar area were sleek and charming - I love the fun touches of art throughout. Such attention to detail in everything! The rooms were comfortable and most importantly very clean, shampoo and conditioner selections were perks! Exercise room was large and had all the bells and whistles. Rooftop bar and views didn’t disappoint! The location was incredibly convenient to everything - uber to the beach, but we walked easily to nearby shops, Starbucks coffee, restaurants etc. I will be returning to this hotel the next time I need to stay in the area, by far one of the best Marriott priorities I’ve visited in the US. This hotel surprised me in every possible way. They have water for you as you walk in and when the doors open, the signature scent of white tea and thyme start to relax you. There is an art gallery on each floor - which a lot of hotels do now, but they also have artists there working for you to talk with and interact. Each room has several creative outlets - a ukelele, a sketch pad, even the privacy sign is creative. The location is perfect, walking distance to theatre, awesome restaurants and if you want the beach, they have a shuttle. Art is everywhere. The Sarasota Opera was a short walk away. Live theater was just across the street. The hotel was decorated with original art everywhere, including inside our hotel room. Our room was supplied with a large leather-bound sketchbook and a couple dozen colored pencils. And a ukulele. In the lobby, a live jazz band performed in the evening (just in case anyone was tired of Puccini). A free shuttle took us to the Ringling art museum to experience even more. We loved this Marriott. It’s so close to downtown restaurants and galleries. It’s clean and a beautiful hotel. The roof top has a nice pool and nite there was a dj. Food was surprisingly good for being a hotel. I would recommend this place. In the room there is a book to draw anything you feel. There are some pretty talent people!!! Wonderful and unique. Not your typical Hotel Lobby. The artwork is fascinating and the restrooms are so chic. (I am not going to spoil what is playing over the restroom speakers, but, just plain cool)! I had to meet someone for a quick business meeting and it was such a nice atmosphere. The Lobby Bar serves a delicious Bloody Mary and during the early evening there is live music. What a nice addition to downtown. Last weekend we went on an all-girls trip to celebrate a 50th birthday and we stayed at Art Ovation. Everything was superb. The rooms are spacious and beautiful. For Molton Brown lovers: you will love the toiletries. The staff is super attentive, the food and amenities are great. Art lovers get ready to be treated to a most amazing exhibit and tour should you wish to do it. Lastly, do not miss the most amazing sunset in the rooftop. The view is spectacular, paired with a full bar and a DJ, you can't go wrong. Can't wait to go back! Hotel is new and in a good location, but surprisingly worn looking already. The beds are hard and gave me a stiff back. The bathroom has an odd design. The shower door that doesn’t stay closed and allows a huge puddle of water to form in the middle of the bathroom. The toilet door is also weird and gets in the way. However, the most disappointing aspect was the subpar service. No doormen and the valet guys just stand around chatting amongst themselves without doing any doorman or bellhop duties. Concierges are not always at their desks. When we checked in, they did not tell us about any amenities. The worst is the housekeeping service. I called for some items like toilet paper three times and waited almost 2 hours before they actually showed up. They don’t do anything other than empty trash, replace used towels, and make beds. Usually hotels will try to replace toiletry products or make it look like they did some cleaning. The only personable hotel employee who seemed to know anything about service was the shuttle driver. I think the art ovation is not under good management at this time. It has potential but is missing the mark in a big way. My husband and I have had dinner here now three times. This last time was the worst. The hotel, a Marriott brand is convenient to the theater and downtown Sarasota. The service is not organized. Many staff were around but not serving guests. After 15 minutes in the bar area, no one had approached us. We moved to our table and had a young intern with basic English taking care of us. The drink order took long and not delivered correctly. The dinner food was uneven with some overdone and others undercooked. Marriott - get your act together. I will not recommend this place again. Fresh and new décor. Love the colors inside and the room was very comfortable. Closed to other restaurant, Theater and beach. Family friendly area with accessible parking garage. Valet kids were a little harsh with driving cars which I didn't feel comfortable living them with my car. 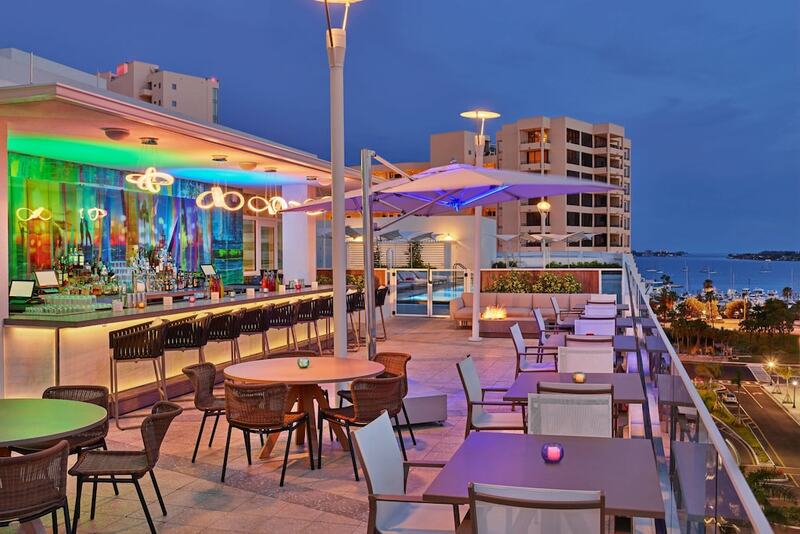 Located in Central Sarasota within 2 miles (3 km) of Sarasota Memorial Hospital, Art Ovation Hotel, Autograph Collection is within a few miles (5 km) of other popular sights such as St. Armands Circle. This 162-room, 4-star hotel has an outdoor pool along with free in-room WiFi and free self parking. Enjoy a bite to eat at Overture, the hotel's onsite restaurant. Savor a meal from the comfort of your room with room service. For your convenience, a local cuisine breakfast is available for a fee. Guests can expect to find free WiFi and 48-inch an LED TV with cable channels and Netflix. Pillowtop beds sport premium bedding and the bathroom offers a hair dryer and free toiletries. Other standard amenities include a refrigerator, a minibar, and a coffee maker. Built in 2018, the brand new Art Ovation Hotel, Autograph Collection offers an outdoor pool, a fitness center, and a rooftop terrace. Onsite parking is available, both free self and paid valet parking (USD 25 per night)—also useful is a free beach shuttle. Multilingual staff at the front desk are standing by 24/7 to help with concierge services, luggage storage, and dry cleaning/laundry. Additional amenities include free WiFi in public areas, conference space, and a 24-hour business center. Local cuisine breakfast is available for a fee. Overture - Restaurant specializing in American cuisine. Perspective - Poolside rooftop bar specializing in American cuisine. Recreation features at Art Ovation Hotel, Autograph Collection include an outdoor pool and a fitness center. The preferred airport is Sarasota, FL (SRQ-Sarasota-Bradenton Intl.). The front desk is open 24 hours a day, and checking in and out are easy with express services. Driving? This property offers free parking, along with a car charging station.